The apartment on two floors is located in a modern facility in a quiet area of ​​Tronzano Lago Maggiore, ideal for two couples or a family with 2 children. The residence offers a breathtaking view of the lake and the surrounding mountains. The spacious apartment offers a modern environment, where you can relax. In the view of the lake, they will fall in love immediately. The large living room is equipped with flat screen -satellite TV with a comfortable sofa. The modern kitchen has a stylish atmosphere with all the must-have appliances such as a stove, toaster, dishwasher, fridge and coffee maker. Also on this floor is the first bedroom with a comfortable double bed, a wardrobe and bathroom with shower. A spiral staircase leads upstairs where there is a second bedroom with double bed, desk, wardrobe and electric roof window. Next to it is a second large, elegant bathroom, with a shower, bidet and washing machine. The apartment also has a private parking. Beautiful apartment in a beautiful position. 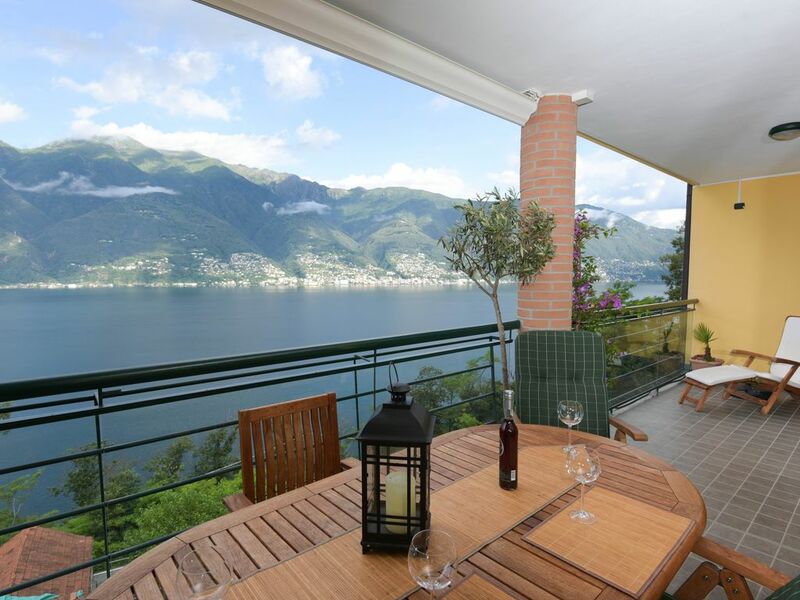 The apartment was very well positioned overlooking Lake Maggiore. It was clean and fitted out to a good standard. A key-safe would have been useful rather than having to meet people on arrival and departure, especially when you're driving and have no idea when you might arrive! An ironing board and a fan would also be a good idea. A few basic staples on arrival would have been welcome e.g. milk, bread etc. Unlimited wi-fi would be much more useful than the limited one actually available. Overall, though, it was a very good place to stay - but don't expect anyone to speak any English in the vicinity. Een mooie woning met een fantastisch uitzicht. Een ruime woning met voldoende leefruimte. Woning was schoon toen wij erin kwamen. Is van alle gemakken voorzien. Maar het balkon spant de kroon. Elke dag mogen ontbijten met het uitzicht zoals op de foto is geen straf. Het uitzicht is in werkelijkheid nog mooier. Mooie plek om op vakantie te kunnen gaan.